The global market for insulation materials has been witnessing expansion owing to the rising demand for these materials in industries such as automotive, aerospace, and building and construction. In order to achieve additional market share, companies in various regions have started adopting several product strategies. Some of the key players in the global insulation materials include Covestro AG, BASF SE, Huntsman Intl LLC, DowDuPont, Owens Corning, Evonik Industries, Johns Manville, bridgestone, and Atlas Roofing Corp. among others. The insulation materials global market was valued at US$65 million in the year 2017. The global market is anticipated to grow at a strong 8% CAGR during the forecast period 2018-2026. As per segment, the fiberglass material is expected to dominate and propel the demand of the insulation materials market in the coming years. In terms of type, blanket insulation and foam boards are widely used in the insulation materials market. As per application, building and construction industry is anticipated to lead the global market for insulation materials in the forthcoming years. According to regions, Asia Pacific is likely to grow and offer huge growth opportunities owing to increasing activities in building and construction sector. The Middle East and Africa is predicted to grow steadily over the forecast period. Insulation is one of the most important technologies for reducing energy consumption in residential and commercial buildings. It acts as a barrier between cold and warm by ensuring that your complexes are cool in summer and warm in winter. The different materials used in insulation serve only one purpose and that is to provide eco-friendly environment and consume energy. The government of U.S has taken some initiatives for accelerating the demand of insulation materials market. Promotion of thermal insulation by U.S government in households with low-income are expected to boost the growth of this market. The U.S government with the help of federal funding has been successful in doing so. In addition to this, there are sufficient funds available for the development of phenolic foams, which in turn is estimated to propel the growth of insulation materials market within the forecast period. Fiberglass is one of the most unique insulation materials that are generally used in duct and rigid board insulation. Fiberglass is expected to offer attractive growth opportunities as it is a low-priced form of insulation. 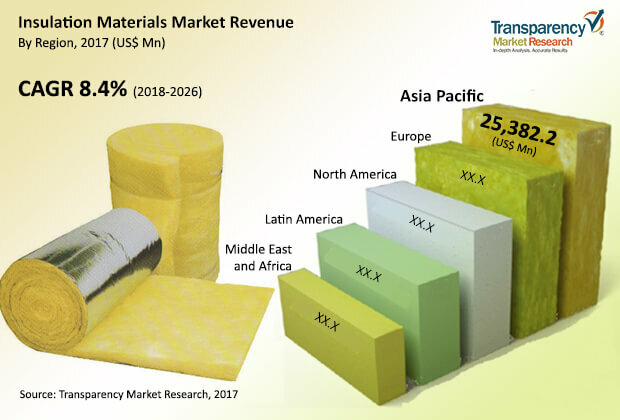 Also, with the rising demand for applications in insulation materials among sectors such as aerospace, automotive, and construction and building are likely to raise demand for this global market. Some essential features linked with superior performance of green building incorporating rising property values, inhabitants comfort, materials durability, and better energy efficiency has surged the preference of best processes in building and construction industry. Few of the best practices include air barriers, huge and seamless roofing systems, and better insulation systems. These features and best practices are likely to boost the building and construction sector which in turn, is foreseen to offer growth opportunities in the next coming years.